Their home is the work of Hugh Kaptur, a beloved local desert modernist architect who designed the 1959 house set amid the historic Ranch Club Estates neighborhood. Michael and Richard wanted Kaptur’s design to truly sing throughout the home. 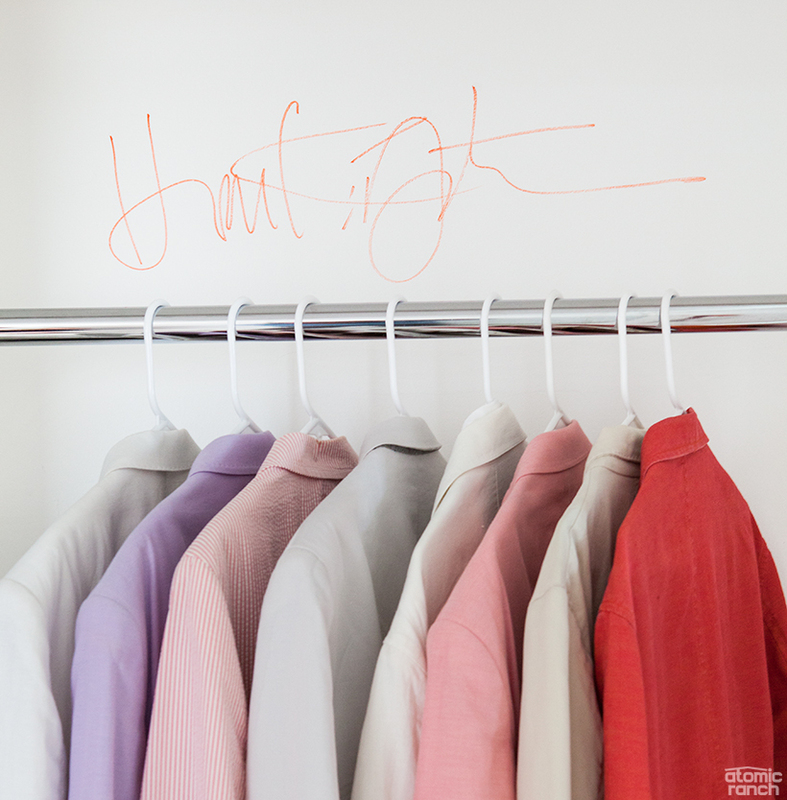 The couple went so far as to have Kaptur—who, at 85 years old, is still working—sign their closet during the filming for the documentary Quiet Elegance: The Architecture of Hugh M. Kaptur in 2012. The bright orange signature only marked the beginning of a process to restore the home to its original purity. Michael and Richard’s wallets are just as happy as their home. Many of the pieces are craigslist steals: The white vinyl sectional, Arne Jacobsen egg chair, “Spider” arc lamp, vintage Saarinen tulip table and authentic Noguchi glass table. A documentary about the home’s designer, Hugh Kaptur, was being filmed when Michael and Richard first moved into their home. The documentarian, Bert Simonis, warned Kaptur that the couple had an unusual request. Kaptur had never been asked to sign a house he had designed, and was a great sport about doing it. To return to the midcentury essence that Kaptur intended, Michael, the handyman of the house, set out to restore—not to remodel. “The house was in remarkably original condition,” he says. Michael’s art studio is an enclosed area at the rear of the garage that opens to the backyard. A simple clip-and-cable system allows him to display his latest works, including a portrait of Richard holding their former dog (on the easel) and a self-portrait of Michael holding sunflowers. Michael reupholstered the distressed Herman Miller chair with vinyl, providing a comfortable place for him to sit and paint. The vintage Luxo lamp and pencil sharpener were Richard’s from his NYC Union Square graphic design studio. 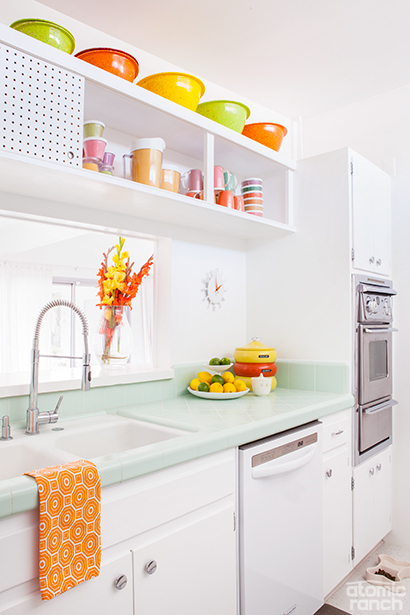 Pomona pink and yellow tile in the bathrooms as well as mint tiles and sliding pegboard cabinets in the kitchen made the house a midcentury dream. Michael removed any midcentury-defiant features that had been implemented by previous owners like non-period wallpaper, drapes and moldings. He then skim coated, plastered, sanded and primed the house. All of these restoration moves, in addition to bringing the flooring down to raw concrete and installing wall-to-wall “kindergarten” vinyl tiles throughout, aimed to create a clean slate. Painting a majority of the home’s interior white also helped to this end—but it also fulfilled the couple’s non-midcentury interests. 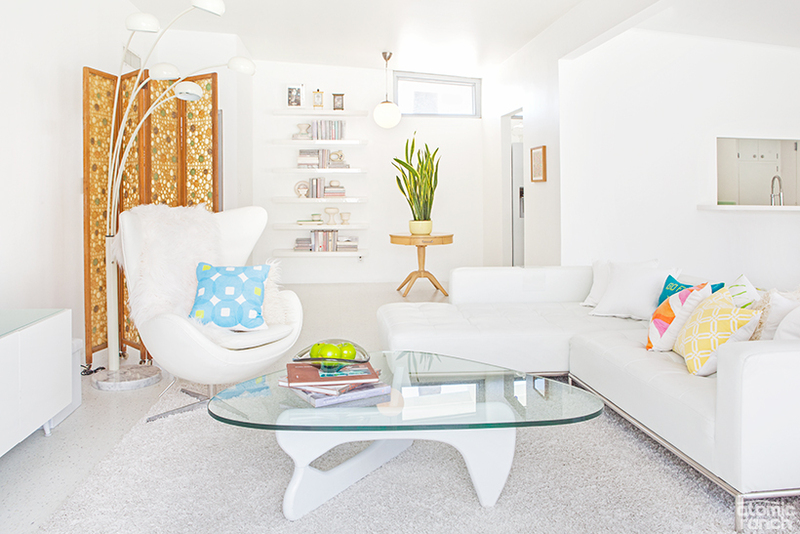 “We like houses that look like art galleries, and art galleries are white, so we painted ours white,” Michael says. The only wall with any “color” is in the dining area and is a cream-on-white interpretation of Andy Warhol’s very colorful 1964 Flowers series that Michael hand-painted. Michael and Richard’s attitude toward the walls also translates to the items they enclose. Retro pieces from the ’50s and ’60s occupy a majority of the home, but Michael and Richard do not adhere to a Midcentury Modern rulebook. Just like the couple, their home is happy-go-lucky. If they like something, they go with it. “We decided we’d collect things that just make us happy, not necessarily because of their midcentury pedigree,” Richard says. Michael made the curtains in the master bedroom and throughout the house from hundreds of yards of swimsuit lining. He highly recommends the rubbery material, saying it never wrinkles, and once a year, because of gravity, it requires a quick trim with no hemming necessary. Michael made all the printed throw pillows on the bed (including the numerous others scattered throughout the house). He designed many of the vibrant prints on Spoonflower, a website that in turn sent Michael the fabrics to work with. Their carefree approach in selecting the home’s furnishings also carries into how they preserve them. Michael often freshens up their décor with a can of spray paint, a move many midcentury purists avoid. Michael acknowledges the mid mod community’s disapproval over his choice to paint—but his itch to craft and fix up is too strong not to satisfy. His passion for personalizing is reflected in the paint jobs on some of the home’s numerous pieces, from the perfectly white Noguchi coffee table to the palette-perfect pepper mill on the kitchen counter. “Michael thinks he can cure leprosy with spray paint,” Richard jokes. 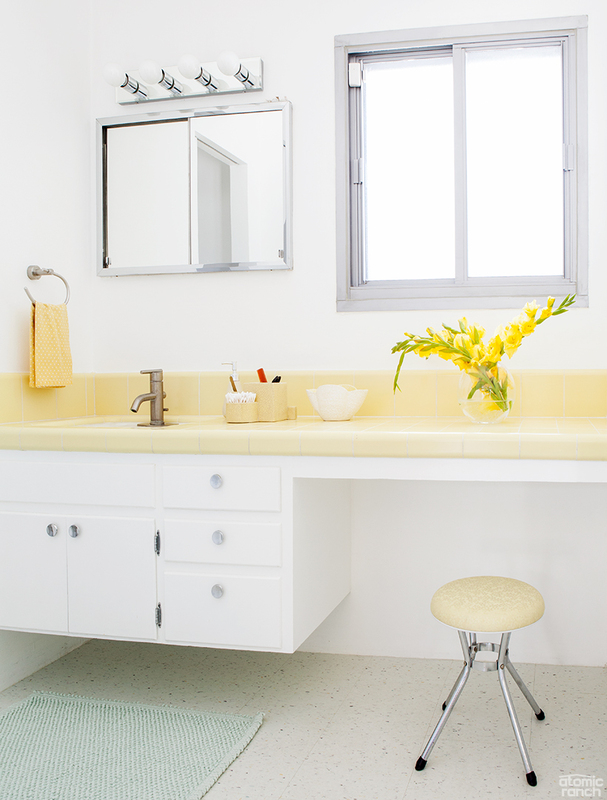 Though neutrals make up most of the home’s foundational color, each room has its own color accents, like this yellow counter in the second bathroom. It complements the yellow tile in the shower, giving each room its own color palette that pays homage to an MCM style. 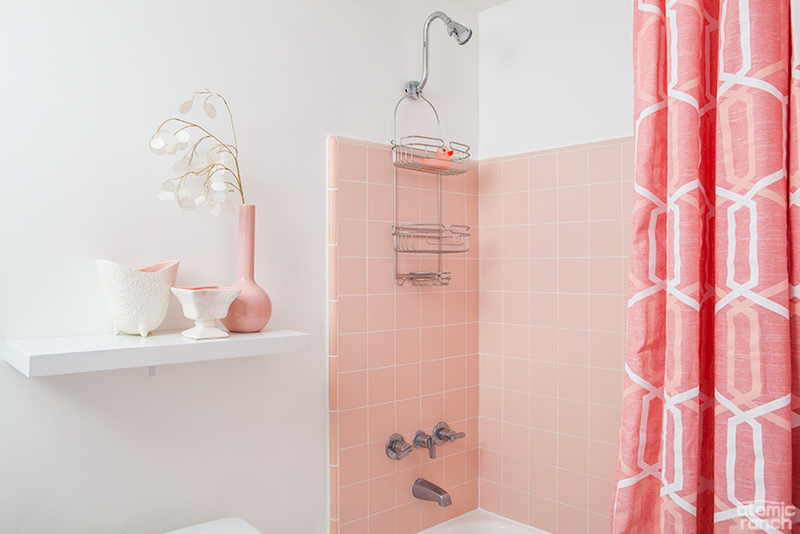 They decided to keep the original soft pink tiles in the bathroom, adding only small mid mod touches to the unaltered room. Michael and Richard’s home now boasts an easygoing vibe, which is an intentional tribute to its history. In 1959, the basic house cost $12,500: A price tag just affordable enough for a buyer to snag so they could happily retreat to a second home in the getaway town. Low maintenance features like wood paneling, Formica, plastic and vinyl amplified the home’s vacation mood. Having lovingly dubbed their home the “Holiday Inn,” the couple sought to consider their guests when designing the more practical elements of the home. Case in point: When you’re on vacation, you don’t worry about ruining furniture—Michael and Richard’s choice of easy to clean furnishings, including plastic furniture, eases this concern. 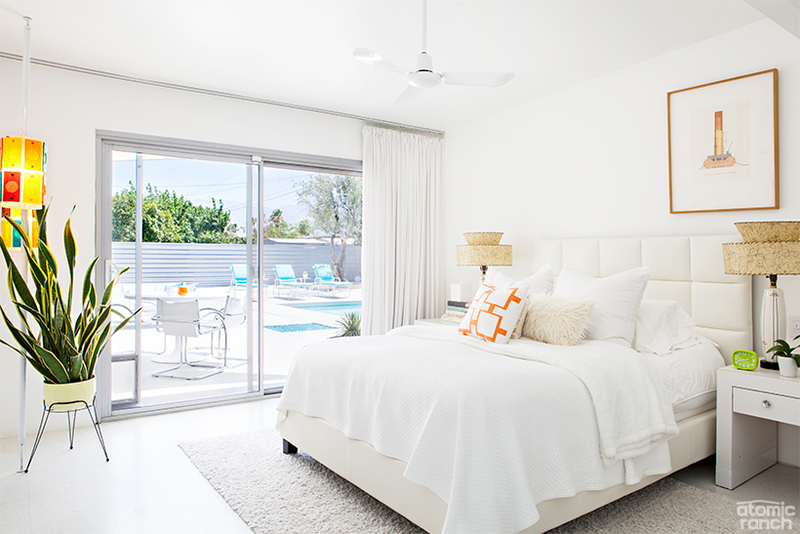 Michael even handmade the floor-to-ceiling curtains out of swimsuit lining material so as to withstand the desert sun. “So if you have a wet bathing suit, sit on the couch,” Michael says. Taking a lighthearted, joyful approach to their home’s design has worked well for Michael and Richard. 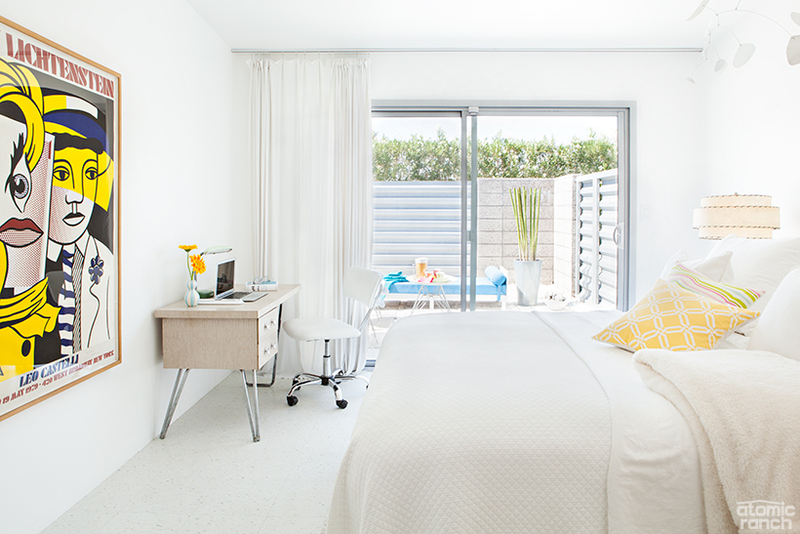 Family and friends now travel the almost 3,000 miles from New York to vacation in the Palm Spring residence’s guest rooms.